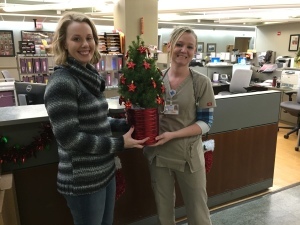 We delivered 32 trees to the Spartanburg Regional Hospital’s heart center, making sure every patient there received one to display in their room. It’s the season of giving, the time to focus on the things in our lives for which we are thankful and to lift the spirit of those who are less fortunate than ourselves. The old saying “It’s better to give than to receive” is without a doubt most appropriate this time of year. Most of us take for granted the privilege of being able to spend the holiday season in our homes, surrounded by the love and comfort of family. However, for many, this isn’t possible. So it’s important to bring a bit of holiday magic to those who are unable to be where and with whom they desire. We took The Shriners Hospitals for Children® in Greenville 100 Amaryllis gifts to be enjoyed by the children and their families. At Jackson and Perkins®, we have a special connection to the holidays, not only because we devote an enormous amount of time each year to creating a gorgeous variety of seasonal gifts, but also because everyone who works here understands the importance of family and just how much the little things mean. In the spirit of spreading joy, we decided to play Santa Claus and donated dozens of live, pre-decorated holiday trees and Amaryllis to hospitals, nursing homes, and residential care homes in the Lakelands and upstate areas. We delivered 32 trees to the Spartanburg Regional Hospital’s heart center, making sure every patient there received one to display in their room. The Shriners Hospitals for Children® in Greenville was given 100 Amaryllis gifts to be enjoyed by the children and their families. Sterling House, a senior assisted living community in Greenwood was provided with a decorated tree for each resident. Overall, 12 facilities received beautiful live holiday decorations, with a total of over 900 trees and over 200 Amaryllis! If your organization would like to join the spirit of giving next year, more information can be found at jacksonandperkins.com or by calling our call center at: 1-800-292-4769. From everyone at Jackson and Perkins®, we wish you a very happy holiday and a wonderful New Year!